The productivity of oil and natural gas wells is steadily increasing in many basins across the United States because of the increasing precision and efficiency of horizontal drilling and hydraulic fracturing in oil and natural gas extraction. Many resource-producing basins are experiencing an increasing yield over time in either oil (Bakken, Eagle Ford, Niobrara) or natural gas (Marcellus, Haynesville). The geology of each oil and natural gas resource play is diverse, and individual rig or well performance can vary dramatically. However, drilling activity in U.S. shale plays is now generally producing greater quantities of oil and/or natural gas than in the past. As noted in March's productivity report, five of the six U.S. shale plays tracked by the DPR have seen increases in oil and natural gas production per rig over the past few years. 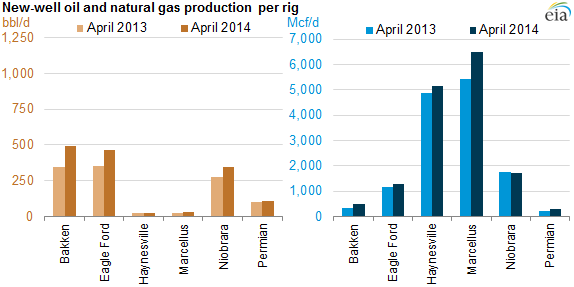 According to EIA's March DPR, the Eagle Ford Shale is leading in increased production of oil per rig, and the Marcellus Shale is leading in increased production of natural gas per rig. DPR data show that each drilling rig in the Eagle Ford Shale will contribute over 400 barrels of oil per day (bbl/d) more in April 2014 than it would have in the same formation in January 2007. At the same time, the DPR also shows that a Marcellus Shale well completed by a rig in April 2014 can be expected to yield over 6 million cubic feet of natural gas per day (Mcf/d) more than a well completed by that rig in that formation in 2007. 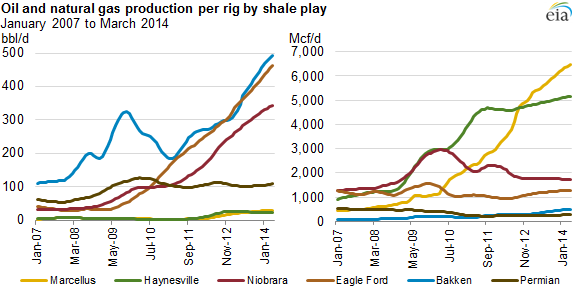 This trend of increasing rig productivity is one factor helping to increase the nation's oil and natural gas production. The latest Annual Energy Outlook forecasts that U.S. oil production will reach 9.6 million barrels per day in 2019, and natural gas production will increase by 56% through 2040.